BERLIN - The Berlin football team knew what it had to do - clean up the mistakes. The 18th-ranked Redcoats did just that. Berlin scored and scored some more, and only committed one penalty. 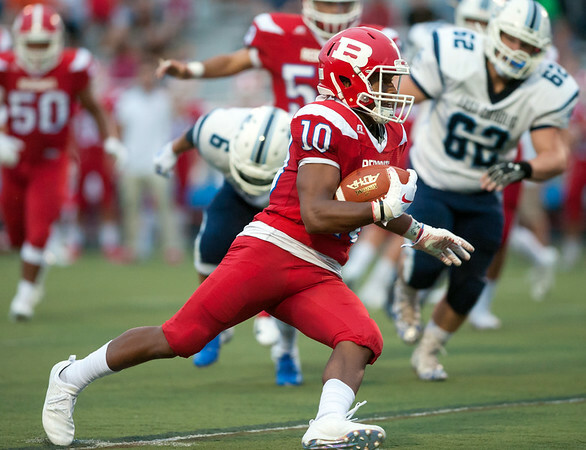 The Redcoats held a 14-point lead by the end of the first quarter and a 36-point lead by halftime as they rolled past East Catholic 50-0 Thursday evening at Sage Park. The Eagles (1-1), overmatched and outplayed, never stood a chance. Berlin (2-0) capitalized on every mistake East Catholic made. Three different Redcoats - Zach Hrubiec, Alex Halkias and Larry St. Pierre - were able to find the end zone not once, but twice. Hrubiec was responsible for the Redcoats’ first touchdown late in the first quarter. It took five plays and 40 yards with quarterback Kevin Dunn connecting with Hrubiec for a four-yard touchdown. The Eagles only had the ball for one play before fumbling, which was recovered by Halkias. After a missed pass, Dunn hit his target, wide receiver Andrew Brochu with a 19-yard passing touchdown. In the second quarter Halkias covered 56 yards over three carries and two touchdowns, the first being a 42-yard dash on the Redcoats’ first possession of the period. It wasn’t much later when Halkias ran three yards for another six points. But perhaps the highlight of the night was when St. Pierre caught the Eagles’ punt and raced 61 yards into the end zone with barley one second left in the first half. St. Pierre’s second touchdown came in the third quarter with 2:55 left on the clock. He covered 35 yards over two carries. Berlin will now have nine days to prepare for its Week 3 matchup against Northwest Catholic next Saturday. Passing-Berlin: Dunn 6-11-81-2TD. East Catholic: Harrison Eklund 0-3-0. Receiving-Berlin: Hurbiec 3-33-TD, Andrew Brochu 3-48-TD. Posted in New Britain Herald, Berlin on Thursday, 13 September 2018 22:44. Updated: Friday, 14 September 2018 00:07.